If you are going to grind the meat yourself, place the food processor bowl and the blade in the freezer to chill for 15 minutes. This helps the meat get evenly ground. Mix all the ingredients in a big bowl with a light hand and try not to over mix. Overworking the meat will make a tough, dry meatball. The mixture should be sticky and wet. Test the mixture by spooning out a small amount and cooking in a frying pan. Taste and adjust the mixture for more salt or more chili flakes if necessary. Scoop meat into balls with an ice cream scooper (or spoon) onto a baking sheet and place in the oven for 20 minutes or until browned. Meanwhile, make the tomato sauce. We use whole Marzano tomatoes in their juice and squish them by hand into a stock pot. Add a few leaves of fresh chopped basil and begin to simmer. By now, the meatballs should be browned - place all the meatballs into the stock pot, making sure the browned bits on the sheet pan make it into the pot. Hopefully all the meatballs will be submerged in tomato, let simmer for an hour and a half. 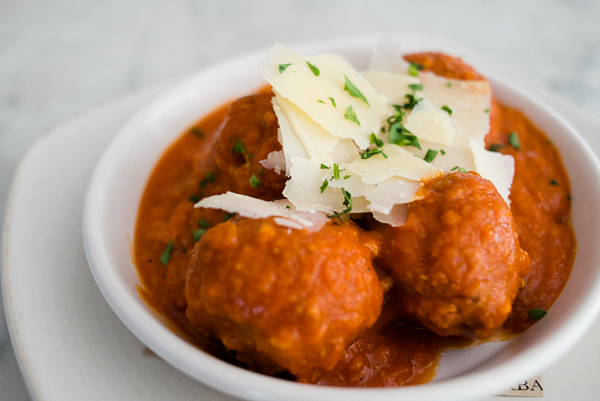 Once the meatballs are tender, remove from heat and serve with fresh parmesan and of course a ladle of the sauce on top.